Hey, where is the ball? Hurry to catch it, cause Microgaming won’t let you leave with nothing. Turning from one theme to another, it is time to have some fun with real football players. 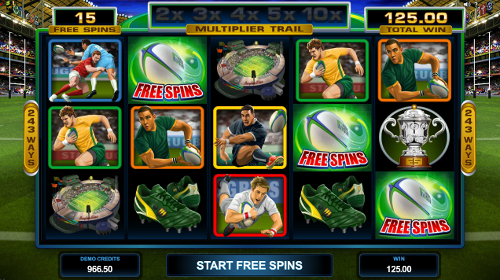 Rugby Star Slot Machine and the whole team are waiting for one more player… you! So, make it quick and run to the 5 reel playground. No other sport can make you feel so excited and curious. Who will win, which team is going to be first, so many questions, the no download match will answer all of them. Besides, there is no chance for you to lose shirt, you have no less than 243 ways to win. Can the ball pass you by? Wow, the gates are protected pretty well. Do you know the helper? It is the wild symbol! By the way, Rugby Star Logo, except its replacing option, also possesses more power. Coming out stacked on reels 3, 4 and 5, the wild creates for you even more opportunities not to miss the lucky catch. It is approaching to you, catch the scatter symbol! The rugby Ball is the thing everyone looks for during the game. No wonder, this fast and tricky icon pays everywhere and can appear for 3, 4 or 5 times awarding you 5x, 50x and 250x Multiplier. Hey, perhaps the little girl from Dragon’s Myth Slots will persuade you follow her? Making bets for this or that team, you’d better pick a coin size and load the slot, here everything is much more profitable. So, starting from $0.01 up to $0.50, you can choose any coin size. Besides, there is an opportunity to place 10 coins a line. Sounds pretty good, moreover, in any case your max bet won’t be higher than $250. Which player do you like best? Here is a small piece of advice, look at the blond Player. This guy is what you need. 5 icons of this talented boy will bring you the top winning. Leave everything aside and watch him running. A $3,000 prize is coming to you on its own! Luck is your friend. Playing the game, watch out to catch the fortune and make it randomly activate Wild Pass Feature. Up to 2 reels will be covered with the wild symbol and your winnings will get even more frequent. Cross your fingers, everything is possible now. Rugby Ball is again in the play! Catch 3, 4 or 5 scatters and watch 15, 20 or 25 Free Spins striking you down. You have such a great chance to relax and sit back. From now on, you don’t have to pay for spins. Besides, winnings up to 10x Multiplier, Rolling Reels will be still active from the base mode to make your gambling fantastically beneficial. Watch the game, cheer for your favorite player and be ready to meet him anywhere through the reels. 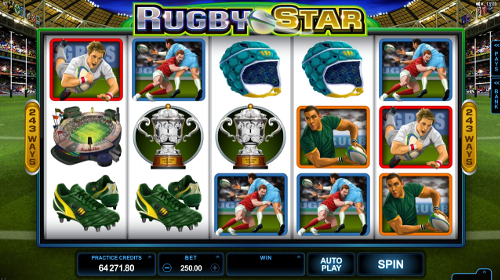 With Rugby Star Slot Machine you don’t have to wait for the matches anymore. 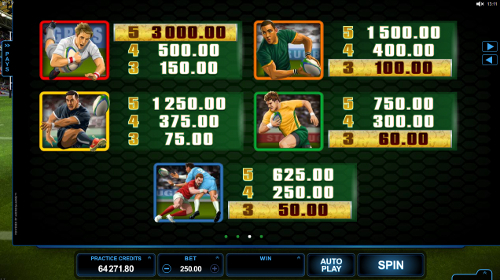 Here you can load the game just like that and earn money while the players kick a goal.